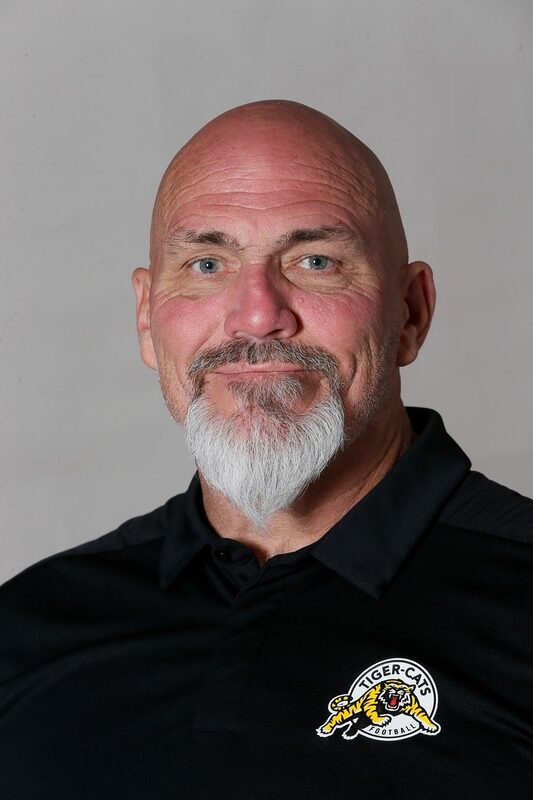 Dennis McKnight was named Offensive Line Coach of the Tiger-Cats March 1, 2018. He originally joined the organization as Special Teams Coordinator February 9, 2017. In his first season as Offensive Line Coach, McKnight led a group that contributed to the club’s offence finishing the season first in the CFL in net offence per game (405.6 yards), average yards gained per pass (9.1) and fewest two-and-outs (72), second in passing yards per game (310.7) and third in first downs (405), sacks allowed (36), rushing yards per game (110.6) and average yards gained per rush (5.6). Additionally, under McKnight’s guidance, Brandon Revenberg emerged as one of the league’s best offensive lineman, finishing the season as the club’s most outstanding offensive lineman and the East Division’s most outstanding offensvie lineman, an East Division All-Star and a CFL All-Star. McKnight, a coaching veteran of over 15 years, has experience at both the CFL and collegiate levels. The former National Football League offensive lineman recently served as Lamar University’s Special Teams and Offensive Line Coach over two seasons (2012-13). Prior to that, he spent the 2011 season as the Edmonton Eskimos’ Running Backs Coach, helping Jerome Messam rush for over 1,000 yards and earn Most Outstanding Canadian honours. McKnight spent three seasons at Southern Methodist University as Offensive Line Coach (2008) and Special Teams Coach (2009-10). After not making a bowl game for 25 years, McKnight helped the Mustangs to back-to-back bowl appearances in 2009 and 2010. He also served two separate stints at the University of Hawaii (1999-2000, 2006-07) in a similar role where he helped the Warriors produce one of the top special teams units in the nation all four years. In 2007, the Rainbow Warriors finished the regular season with a 12-0 record and earned a berth in the 2008 Sugar Bowl while being led by the top ranked offense in the country. McKnight’s blocking schemes helped quarterback Colt Brennan to a third place finish in the 2007 Heisman Trophy race. In between his two stops at Hawaii, McKnight coached at Grossmont College (2002-03) and San Diego State (2005-06) as Special Teams Coach and Tight Ends Coach, respectively. The Dallas, Texas native was an offensive guard in the NFL for 11 seasons from 1982 to 1992, including eight with the San Diego Chargers, two with the Detroit Lions and one with the Philadelphia Eagles. In 1988, McKnight was an alternate for the Pro Bowl as a member of the Chargers. McKnight actually broke into coaching after his college career ended, spending the 1981 season as a graduate assistant at Southeast Missouri State before his playing career in the NFL. He was an All-Missouri Valley performer as a senior at Drake University where he earned his bachelor’s degree in Education in 1981.